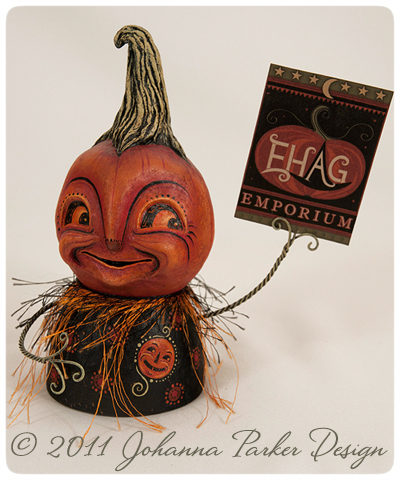 It's the last day of the month which means that the EHAG Emporium is again open with a fresh offering of Halloween folk art from a sampling our artist guild members. This time around, I was able to play along and created a fun and rather different piece for your consideration. 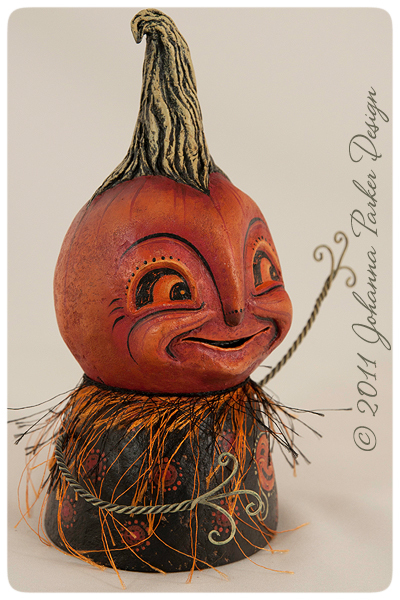 "Blushing Pumpkina" is a one of a kind, "mini bust" pumpkin character. She is painted in rich undertones of magenta rouge which naturally made me think that she was a bit blushed! With recessed features, carved for Halloween and protruding cheeks, she is quite the cutie! A gnarling stem rises with a twist and adds height and interest to her look. Blushing Pumpkina (Pump-keen-a) has a pair of wiry vine-like arms painted soft green to match her towering stem. With her left arm raised, you have the option to attach your favorite photo or small card within the prongs of her fingers. And, she comes with the sweet EHAG Emporium tag that I designed as well. Keep scrolling down for a few photos, and thank you for your interest! * A pair of orange and black strands of wispy whimsy threads trim her neckline and add softness. 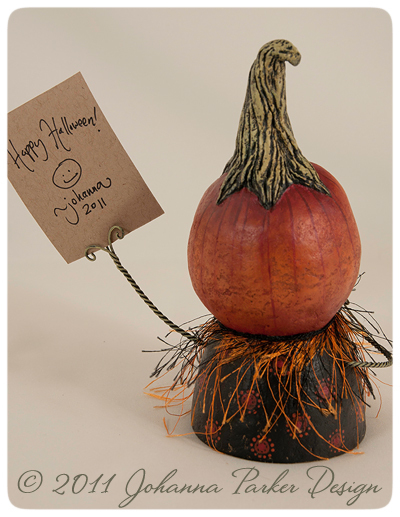 A jack-o-lantern painted pendant smiles back at Blushing Pumpkina and marks her sweet heart. I may not be available to take your request at the start of the sale, so I thank you for your patience and will return your email as soon as possible. * She's such a little flirt as she offers a wave to you! * A simple floral-like pattern of circles and dots repeats itself across the back and decorates this little beauty! She ships with the EHAG Emporium card, signed on the back. Images & Design, © Johanna Parker Design, LLC 2011. Photos may not be used without permission.